This post was written by NCTE member JM Farkas. About 2,220,000 hits in 0.50 seconds. These are the results of a Google search for blackout poetry lesson plan. 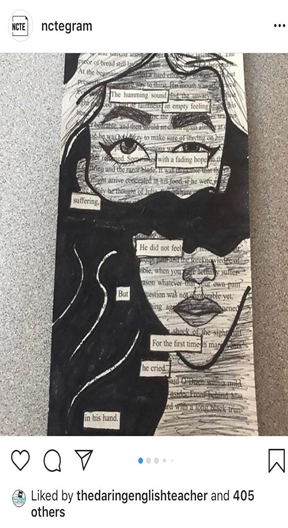 When I taught 12th grade Creative Writing, blackout poetry was one of my most successful lessons. There is the element of surprise and creative disruption, when the students walk into the room and their desks are piled with permanent markers, scissors, stacks of newspapers, and used books from secondhand stores. Students also seem less intimidated by the process of erasing, as opposed to composing new writing. Surprisingly, after I taught this very lesson, that same question became the basis for my first book too. 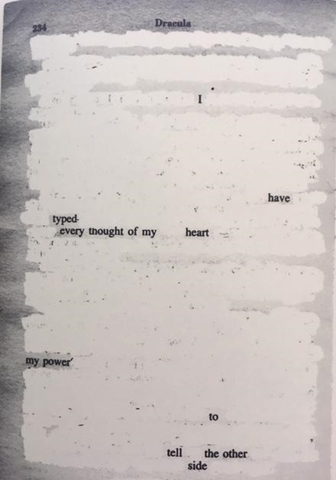 Last year, I released a book of blackout poetry called Be Brave: An Unlikely Manual for Erasing Heartbreak. I radically transformed Beowulf into a modern, poetic pep-talk for the broken-hearted, using the same version of the ancient epic that I taught to my 9th graders. The introduction unexpectedly evolved into a love letter to my students, to teaching, and to my former teachers as well. From personal experience, I can tell you that there is something deliciously fun and subversive about blackout poetry. 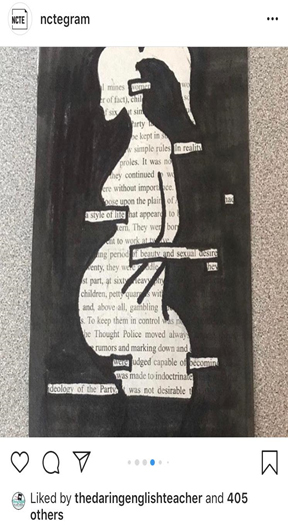 So often, our students might complain that the classics and required readings on our syllabi don’t speak to them, but blackout poetry provides an opportunity for students to “make” the words say whatever they want. Image used by permission of Jen Bervin. 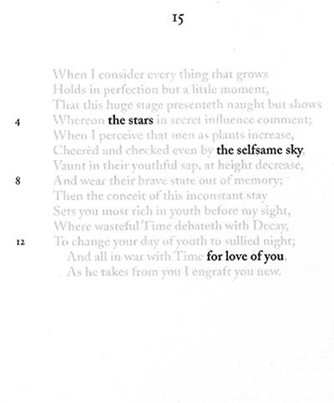 Bervin’s gorgeous erasures of Shakespeare’s sonnets eschews the opacity of a full blackout and instead employs a subtler method that allows the source text to show underneath. Bervin sees the writing process as a somewhat collaborative experience with writers who have come before us: “When we write poems, the history of poetry is with us, pre-inscribed in the white of the page; when we read or write poems, we do it with or against this palimpsest.” Bervin’s erased sonnets are stripped to become nets to capture new words. This approach allows students to experience close readings of Shakespeare’s original work, while discovering a modern poet’s striking, spare, and evocative new language. Bervin is also a fascinating visual artist, worthy of further exploration. Students might be interested in checking out her recent project, River, a large scale installation of the Mississippi River, using 230 feet of hand-sewn sequins. Image used by permission of Mary Ruefle. Ruefle is a magnificent poet and essayist, with genre-bending work often appearing in Best American Poetry, or featured in influential literary destinations, such Brain Pickings. The erasure technique for A Little White Shadow is a whiteout, as opposed to blackout, creating a tone that evokes a greater sense of possibility and wonder. Ruefle surprises readers with captured language that can read like stunning, literary fortune cookies or magical spells from a most generous Poetry Witch. She also has an incredible companion essay, “On Erasure,” which begins as a work of nonfiction and then transforms into an erasure itself. It’s a great model for students to use on their own narratives, and perhaps even on unexpected texts like their college application essays. Image used by permission of BIRDS, LLC Press. 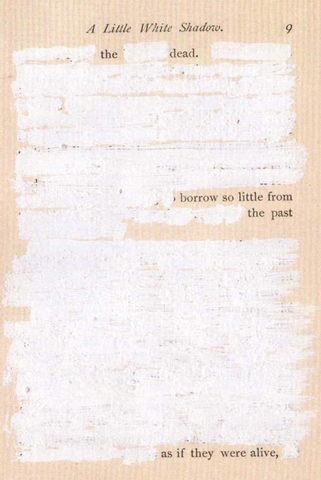 Although the final format of the book consists only of unerased words broken into standard poetic lines and stanzas, a few whiteouts are featured at the end of the work. Unlike some other erasures that can produce language that is somewhat disjointed, Berggrun’s found poems fully stand on their own. 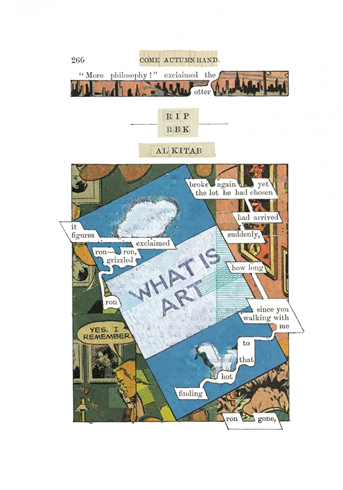 An engrossing work-in-progress since 1966, A Humument began when the artist Tom Phillips started to paint, collage, and draw over an obscure Victorian book called A Human Document. The original text was written by W.H. Mallock in 1892. This artist book has become a cult classic that includes over 300 full-color pages of stunningly transformative art. Phillips’s website includes an audio recording of the artist-author reading the final version in its entirety. In 2016, A Humument was completed, after 50 dedicated years of work. It’s a beautiful reminder of stick-to-itiveness for our students, a testament to true artistic grit. JM Farkas is the author of Be Brave: An Unlikely Manual for Erasing Heartbreak—an erasure of Beowulf via blackout poetry. Her poetry appears in many literary magazines, and her work can also be found in The New York Times and Buzzfeed. She is a former high school English teacher and writing center director.